S.McD. Even plastic people have the right to be loved. At the Fanfest, my friend Felix and me bought copies of the boardgame EVE Conquests. 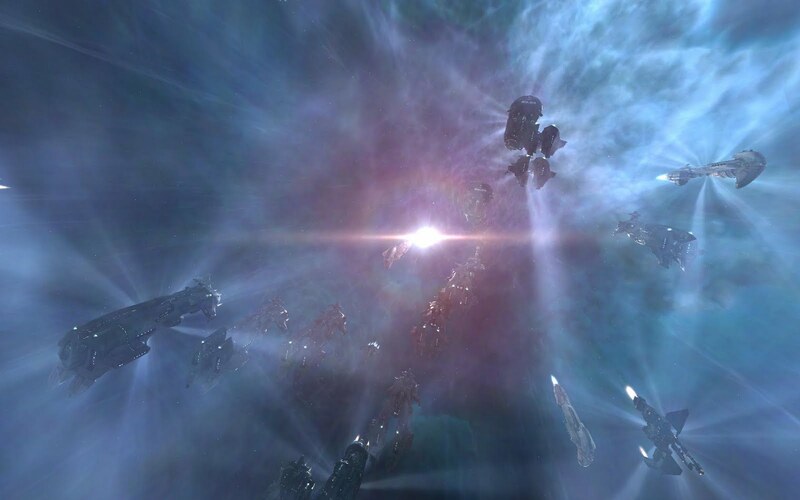 This game designed by Pétur Örn Þórarinsson is set in the same universe as the massively multiplayer game (MMO) Eve Online. After one missed opportunity at Nils's place, I managed to actually try the boardgame at Felix's place yesterday. We were six players and formed two tables, one with four players (Felix, Björn, Dani and Rüdiger) and the other one with three players (Christoph, Dominic and me). Playing a game of EVE Conquests is not necessarily easy. It thrives on complexity but at the expense of clarity. The game is huge -the board needs a real table. While the MMO allows you to pilot your own personal space ship and do whatever you want with it, the boardgame addresses the strategic scale of the war to end all wars: a conflict where you play the role of one of four interstellar empires bent to conquest. The first group finished first. Apparently, Dani had positioned her empire in a corner of the star cluster, and by pure chance she was able to claim high value regions there. The other empires were not even adjacent to hers and were not able to attack her quickly enough. Björn suggests the randomness induced by the 'political landscape' mechanism (claimable regions) is a tad excessive. It nevertheless guarantees replayability and provides dynamic tension. Players need their empires to be central and close to any potential target but also to protect them and their assets. Our group finished one hour later. Dominic chose to play the Amarr slaver empire, I picked the Gallente cheese-eatin' surrender monkey empire and Christoph settled with the Minmatar rabble. Dominic quickly claimed two core regions which gave him a slight headstart. Christoph began to expand in the East of the star cluster while I headed for the North. There I was able to claim two high-value regions, including, ironically, Deklein, current home of the Tau Ceti Federation (a French-speaking Eve Online player alliance). At this point, my opponents felt threatened. Christoph attacked first and took a few regions, stealing one of my region cards. The Amarr Navy soon joined the fray on my southern flank. By chance, I was able to stop the advance of both invaders and even prick them here and there. The decisive moment in the game happened in the second semester of the third year of the war, when I used a special card to postpone the logistics turn of Christoph by one month, thus becoming able to attack him first. I recovered one region, put an outpost over it and claimed another pair of regions, which widened the victory point gap to the point where I just had to wait out a couple of months to win the game. Long live the Gallente Federation! Overall, we had a lot of fun and I recommend EVE Conquests to players who like ambitious boardgames and/or Eve Online. Playing in the same setting but on a different level is refreshing and fun. We are all Eve aficionados except Björn, Dani and Rüdiger, who are "mere" boardgame geeks. Both Christoph and Björn like especially the calendar-based turn mechanic. The dice-based battle system is also popular. Somebody suggested that the boardgame could be converted into a web application but I do not see the point. The laughs we had and Felix's bolognese could not be electronically emulated. The resource tokens, though easy to use, add a layer of rules I am not endeared with. After the first year or so, everybody had enough outposts to fund wars until the end of time. I heard a comment around the table about the Eve players of the Pandemic Legion alliance and their R64-made warchest worth trillions of isk. At that stage, resource tokens become irrelevant. A bit later in the game, you hit a second wall when your number of units reaches 60 and the only way you can build more is by losing some first -but that limit is meaningful and helps the endgame be battle-heavy. The color scheme is a source of confusion. I call it "the rainbow of pain". In EVE Conquests, colors are associated to one of three phases: development, production and logistics. Our 'National Seals' (used in the calendar system) are of three different colors, and so are our outposts. It contradicts my habits both as a boardgamer (to every player his color) and as an Eve player (golden Amarr, greenish Gallente, etc). What is more, the colors of different components do not seem to perfectly match each other. The fact that colors are also used to differentiate the four empires, the four nebula of the star cluster and the three rows of the 'political landscape' does not help either. The rulebook is obscure. Spending the first two hours stumbling over various issues and wondering how to play the game, after reading the manual, is not a good sign. The other table had it easy, Björn is a boardgame mutant who feeds on arcane rulebooks. Reading the manual again, I just discovered that there are, in fact, page numbers... grey on black, smallest possible size letters are, for practical purpose, inexistent. The thing is, game authors may not be the most adequate persons to write the rulebooks. Rulebooks should be written for gamers who want to play right now, by the guy who did the demo at the gaming convention. This guy has thirty seconds to convince the passerby to play and just a few minutes to pitch everything: the setting, the victory conditions and the mechanics that make the game tick. The pitch gets polished like a rock in the middle of a river. Right now, the rulebook tastes too much like brain soup. I may or I may not be a dummie. d) to "match" (same part of space or same letter/color on the 'political landscape'). You want to claim regions and to destroy outposts from players who have claimed them! Beware, you cannot destroy your own outposts, so each one you build is a potential target for the other players. The regions which can be claimed are different each time and change each time regions are claimed. Every empire's army will probably focus their attention to different places on the board during the war. That's for the grand strategy. You want to build outposts and destroy outposts. Outposts allow you to do more actions because, each time you build one, you get a resource token which can fund additional actions. Outposts generate resource tokens of the same type (orange logistics outposts generate orange logistics tokens). Each empire has three 'National Seals', one for each turn (development, production, logistics), which you will move on the calendar. If, for example, we are in January and your development National Seal (the blue one) is the closest to the center of the calendar, it's you turn to play. On a development turn, as displayed on the empire card, you can always do at least one development action and your next development turn happens then two months later (move your National Seal to March). If you choose to spend one extra development resource token, the empire cards indicate that you can do three development actions and your next development turn is four months later. Etc. You still want to build outposts and destroy outposts. First of all, you can build units in your headquarters and in your outposts during your production turn. Three max per region per production turn. To build an outpost in a region, you need units of your own in all regions connected to it. Expand into the region you want and all adjacent regions. That happens during your development turn. If some adjacent regions do already belong to another empire, just plant an agent (a spy!) - a unit which does not give you access to the region but who stays dormant until you attack there or are attacked from there. The logistics turn allows you to move stacks of units to any connected point in your empire and to destroy enemy outposts by attacking the regions they are in and killing all units guarding it. Go forth now, align the stars, build outposts and destroy outposts. Pretend to be the innocent carebear and attack the other players. Make alliances and honor your word or resort to devilish backstabbing. I intend to play the game more in the future, now that I have managed to get some sense out of it. I just need to find myself more Germans! EDIT: After reading the rules for the fourth time, I think I am making some progress and the resource tokens system does now make sense, at last.